For better readability, I now provide bar graphs with the first one being an average IOPS of the last 400 seconds and the second graph displaying the IOPS divided by standard deviation during the same period. Average IOPS provides a quick look into overall performance, but it can easily hide bad consistency, so looking at standard deviation is necessary for a complete look into consistency. 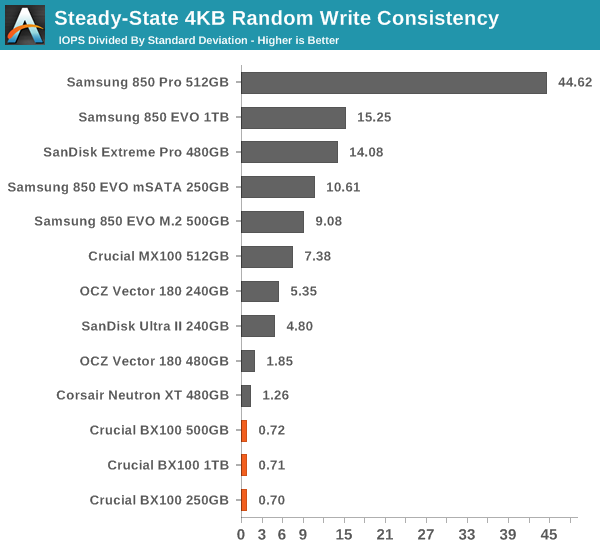 Steady-state performance has never been Crucial's nor Silicon Motion's biggest strength, but 5K IOPS is fairly average for a value-oriented SSD and for the target group the performance is just fine. As some of you have mentioned in the comments, displaying standard deviation alone isn't very useful because it totally ignores the IOPS, so I've changed the graph to IOPS divided by standard deviation during the last 400 seconds of the run. The SM2246EN has always been very inconsistent and it appears that the BX100 is no exception since it has the worst consistency we've tested so far. 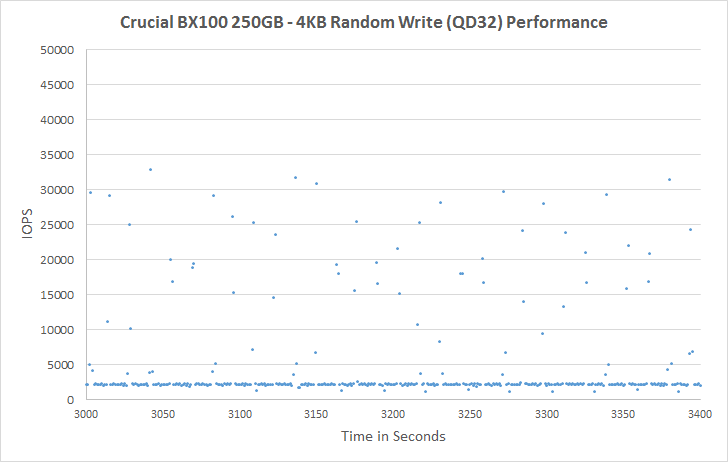 Putting the IOPS under a microscope shows that the consistency really is poor. 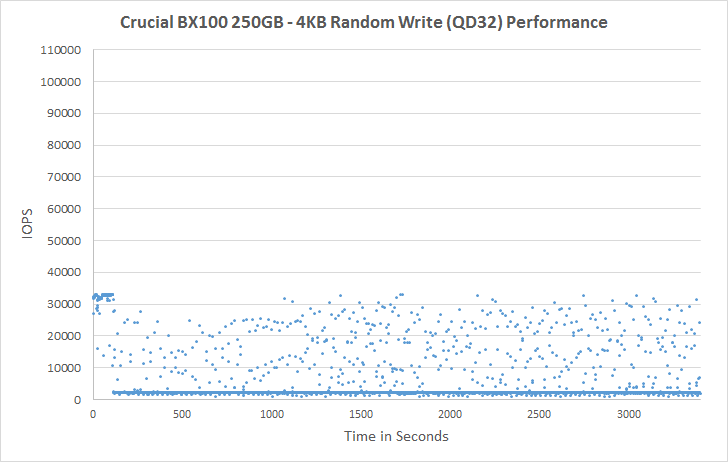 That's nothing new to the SM2246EN and the graph is very similar to the other SM2246EN drives we have tested, although I was hoping that Crucial would have tuned the firmware for better consistency. 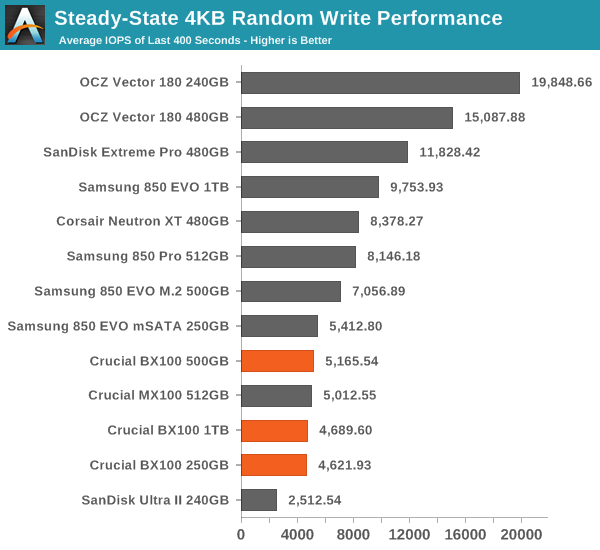 On the other hand, the users buying the BX100 are unlikely to put the drive under harsh 4KB random write workloads, so all in all the consistency isn't much of an issue.